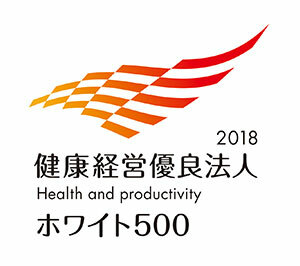 We are pleased to announce that KONAMI HOLDINGS CORPORATION has been certified as an "Excellent Health and Productivity Management Corporation 2018 (White 500)," a corporation that implements excellent health and productivity management practices in cooperation with insurers, for the second year in a row. 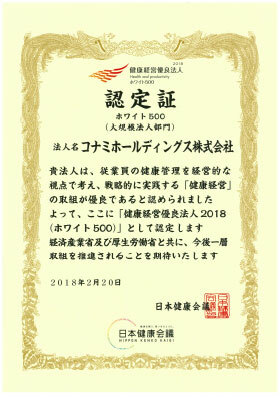 The program is jointly administered by the Ministry of Economy, Trade and Industry (METI) and Nippon Kenko Kaigi. The "Excellent Health and Productivity Management Corporation (White 500)," established in 2017, is a program jointly administered by the Ministry of Economy, Trade and Industry (METI) and Nippon Kenko Kaigi, which consists of leading members from the financial circles, medical-related associations, and local municipalities. The program recognizes large corporations that implement excellent health and productivity management practices in cooperation with insurers. Its goal is to expand the number of corporations implementing excellent health and productivity management practices. In the second year of the program, 541 corporations were recognized in the "Large Corporation Category (White 500)." The Konami Group places special emphasis on establishing a relationship in which employees can grow as the company grows, by creating a workplace that enables every single employee to maximize their talents. We conduct an array of programs to support the health and fitness of our employees. For instance, we keep nurses on staff at our offices, and conduct regular health check-ups with industrial doctors. We also set a framework where our employees always have easy access to health-related advice. In addition, to promote the maintenance of our employees' health and work-life balance, we set a recommended date for employees to take paid leave each month, conduct regular stress check-ups, arrange for medical personnel to administer inoculations within our offices as a preventative measure against influenza, and arrange for on-site dental exams. In cooperation with Japan’s leading combined health insurance group Kanto IT Software Health Insurance Association*, we also make ongoing efforts to maintain and promote the health of not only our employees but also their families. We conduct various family-oriented programs, such as active lifestyle-encouraging events (e.g. Walk Meets), as well as the announcement of visiting health check-ups for women. KONAMI HOLDINGS CORPORATION is committed to promoting work-style reforms aimed at achieving better results, by continuing to improve upon the workplace framework so that employees can work more efficiently. *Kanto IT Software Health Insurance Association is a combined health insurance group with 7,074 member companies, and insures 460,799 people (as of the end of January 2018). Our Director and Executive Vice President is Chairman at the Association.